Karni Mata was a female Hindu warrior sage born in the Charan caste. Also known as Shri Karniji Maharaj, she is worshiped as the incarnation of the warrior goddess Durga by her followers. She is an official deity of the royal family of Jodhpur and Bikaner. She lived an ascetic life and was widely revered during her own lifetime. At the request of the Maharajas of Bikaner and Jodhpur, she laid the foundation stones of Bikaner Fort and Mehrangarh Fort, the two most important forts in the region. The most famous of her temples is in the small town of Deshnoke, near Bikaner in Rajasthan, and was created following her mysterious disappearance from her home. The temple is famous for its white rats, which are treated as sacred and given protection in the temple. Another temple dedicated to her during her lifetime differs from others in that it does not contain an image or idol of her, but rather contains a foot-print to symbolize her visit to that place. Karni mata is also referred to as Nari Bai. According to tradition, Karni mata was originally the wife of depoji Charan of the village of Sathika. However, she later expressed to her husband her unwillingness to engage in matrimonial relations. He initially humoured her, thinking that she would relent in time. Instead of doing so, Karni arranged for him to marry her own younger sister, Gulab, so that he might have a proper married life. She herself remained celibate all her life, with the concurrence and support of her husband. The Ropeway can be accessed from Deen Dayal Park and if you wish to choose the staircase you can access it from the Manikylal Verma Park (Doodh Talai Lake). It takes around 15-20 minutes to climb upto the Karni Mata temple from staircase; whereas it takes 5 minutes to reach via ropeway. 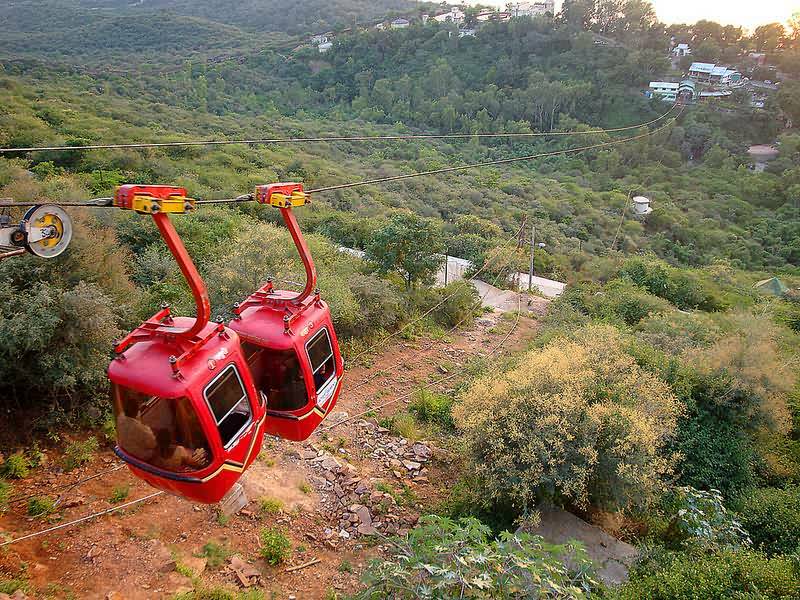 The ropeway, that connects the Temple at Machla Hill Top and Deendayal Upadhyay Park, was built by Businessman Kailash Khandelwal in collaboration with UIT. The ropeway links the two places through a fixed grip mono cable of 387 meters. In ordinary days four Gondolas run to and fro, which are increased to six on special occasions. While traversing in Gondolas between mountains on the Bank of Lake Pichola, a captivating aerial view of Udaipur’s richness and natural beauty accompanies the visitors up to the Temple. Foreigner children below the height of 110 centimeters: 150 (Approx).